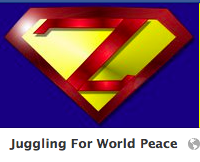 Web Series Today: Are you Juggling For World Peace? Are you Juggling For World Peace? View other Juggling for world peace community videos. Join the Juggling for world peace Bebo group. juggle pple ...because u can!!!! Remember Joe, it's not about juggling "well," it's just about juggling! When juggling actually has anything to do with world peace, I will juggle for world peace. If you are juggling then you are not killing anyone....and the World will be more peaceful....so anon, time to start juggling. The original FB group has to be moved, so if you were once a member, you will have to join again!